Is it wrong to be talking about these things in August? Here on the east coast, we are gearing up for quite a weekend. Please be gentle with us Hurricane Irene! I've got some things planned for the stormy days ahead - a few art projects, recipe card filling out (I really do enjoy that sort of thing), cinnamon roll making... and of course the usual preparations in the likely event we lose power. It gets me into camping mode as far as food is concerned. Things need to be simple, require very little fuel to prepare, and be the sort of foods that we look forward to. 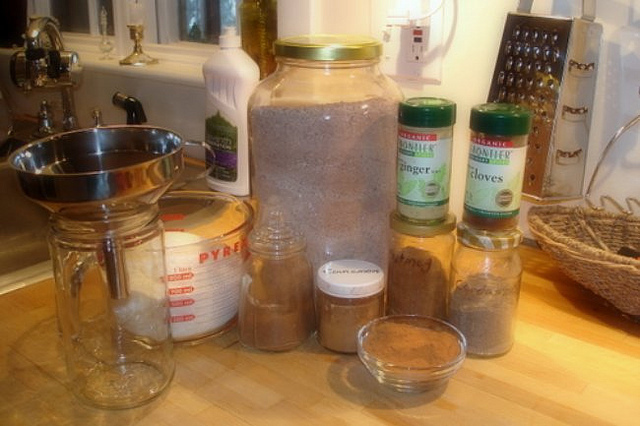 Instantly prepared mixes are not always as nutritious as the at home counterparts. Chai Tea and Hot Cocoa are both made differently for us at home. Honey in place of sugar, real milk and whole tea leaves instead of powdered, you get the idea. But on the trail (or when preparing for a hurricane), a little convenience goes a long way. Today I'll share two recipes from our camping kitchen. Whether you are heading off with your backpack, preparing for a power outage, or simply thinking of the cooler months ahead - you just might like to make a little hot beverage mix. Combine the mix. I run it in batches through the blender to get it really good and powdery, dissolves nicer. Add 2 rounded TBS. mix to 8 oz. hot (not boiling) H2O. Put your feet up and sip away. Mix in a large bowl well. I also run this through the blender in batches to make it very fine and powdery. Not an essential step, but nice to do. Use 1/3 cup mix with 8 oz. of hot H2O. Feeling up for a little outdoor inspiration? Check out National Geographic's film about the Appalachian Trail. You can stream it instantly on Netflix. "For more than half of the US population, the Appalachian Trail is less than a day's drive away. But precious few know it's splendor, or understand it's power." Enjoy yourself this weekend, and stay safe my fellow east coasters! Hello there! This blog post couldn't be written much better! Looking through this article reminds me of my previous roommate! He always kept preaching about this. I'll forward this article to him. I too am an aspiring blog writer but I'm still new to everything. Do you have any points for inexperienced blog writers? I'd really appreciate it. Actually when someone doesn't be aware of after that its up to other people that they will assist, so here it takes place. Greetings, There's no doubt that your web site could be having browser compatibility problems. When I look at your website in Safari, it looks fine however, when opening in I.E., it has some overlapping issues. I merely wanted to give you a quick heads up! Besides that, excellent site! My blog has a lot of unique content I've either authored myself or outsourced but it seems a lot of it is popping it up all over the internet without my authorization. Do you know any techniques to help stop content from being stolen? I'd definitely appreciate it.